A loyal and valued member of Vertu Motors Volkswagen in Mansfield has had his hard work rewarded after completing the ‘Parts Advisor Qualification’ assessment. Steve Wilkins, 52, from Mansfield has been with the Chesterfield Road North dealership for more than 15 years and is widely acknowledged for his product knowledge and customer service from both colleagues and customers. 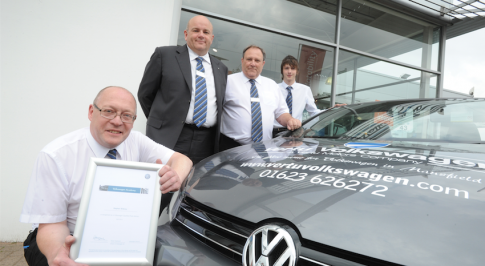 He attended the Volkswagen National Learning Centre to complete the award, which is based around product knowledge and customer satisfaction and care. Over several years Steve has undertaken professional development with Volkswagen culminating in this qualification which is the highest level achievable. Steve, who is also a keen football supporter, has worked in the motor trade for more than 35 years after getting his first job in a garage at the young age of 16. After joining Vertu Volkswagen in 1999, Steve has become a valued member of the team as a result of his dedication and willingness to go the extra mile. Steve is also mentoring Daniel Holland, a young apprentice on the Volkswagen Parts Programme Apprenticeship Scheme. “Steve deals with every customer with passion and prides himself on making sure every customer has the part they need. He is always here at 8:00am every morning to open up the parts department and make sure we are prepared for the working day.